Into August, but the weather this week in Edinburgh has felt more like November. Some of the world’s biggest brands have had a slogan that’s become instantly recognisable. L’Oréal? Because You’re Worth It. 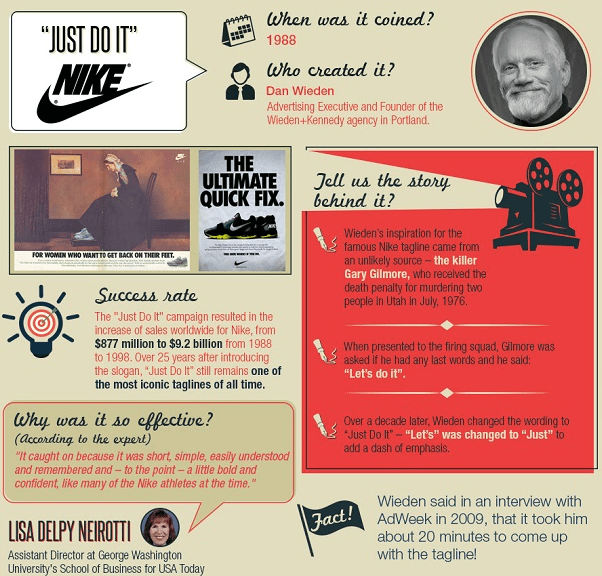 This infographic, by Australian agency M2 On Hold, shows the stories behind some of the world’s most recognisable slogans. For example, here’s a snippet showing my favourite slogan of all time: Just Do It. Nice bit of marketing history. See the full infographic here. This hasn’t turned into a music blog mid-post, but Foals’ new video has been filmed on a pretty decent interesting piece of tech: GoPro’s new spherical rig which has allowed the UK band to create a somewhat VR/interactive music video. It’s interesting, and certainly innovative but I’m unsure as to how well it’s been executed. I think I prefer the interactively inferior, but better executed multi DSLR set-up that Chiddy Bang used in terms of changing the way music videos are filmed. Google Translate isn’t new, but it has gotten bigger. As someone who speaks more than one language, Google Translate has been and continues to be an enormous help when you come across words that don’t jump out at you as to what they mean. This video from the Translate team is a bit of fun, but it showcases their amazing ‘live translate’ feature which has expanded recently from 7 to 27 languages. Simply point your phone’s camera and it’ll translate the words into another language. No more ordering mystery meat when you’re abroad. And the video’s set to La Bamba. What else do you need? Instagram has long been the bane of social media managers’ existence. One part of their terms and conditions didn’t matter for 99% of their individual users, but made it a pain for those who helped run a brand’s presence. You could only post via mobile device, and there was no Twitter-esque ‘switch accounts’ element. So each time you wanted to post to a different username, you had to log out and log in, all on mobile. Now though, Hootsuite have announced integration with Instagram, following up Sprout’s integration a few weeks ago. Instagram’s terms and conditions still prohibit third-party posting, so Hootsuite have created this workaround, similar to ones such as Latergram. Read more here. Instagram have also announced the opening up of their advertising API to certain partners which will effectively see all advertisers given the ability to plan campaigns, cross-promote, plan, and monitor their Instagram marketing activity. Read the article here. The social network has been granted an updated patent on technology that can be used by lenders to discriminate against borrowers based on the borrower’s social network connections. Basically, if your friends with loads of people who have poor credit scores, you may end up finding yourself struggling for a loan. It doesn’t seem fair, but this could be used with all sorts of little details such as time-taken reading the loan pages, or if you fill the form out in all-caps (or no caps), to glean a far better understanding of the borrower and perhaps helps lenders to judge risk. Maybe it’s time to have a Facebook friend clear out… Read the article here. So in fact, there were 6 Top Reads of the Week this week. Was there a piece of interesting tech or marketing news that we failed to mention? Let us know in the comments or @VelocityDigi.